Researchers at WSU are working to decrease bacteria on fruit. Reducing food contamination and improving the safety and quality of food is what motivates one scientist at Washington State University. Shyam S. Sablani, a WSU associate professor, is currently working to make frozen red raspberries less susceptible to harmful bacteria by using Ultraviolet light-C or UV-C light. The Center for Disease Control and Prevention estimates that about one in six people in the United States get sick from eating contaminated food each year, and because of this a new food safety modernization act was signed into law. The new act focuses on preventing food contamination, unlike the previous act, which was over 70 years old and focused on responding to contamination. Raspberries cannot be washed like other fruits, because they are delicate and fall apart easily. They also have a short shelf life and typically last six to seven days. Within that time the berries also have to be packaged and shipped. 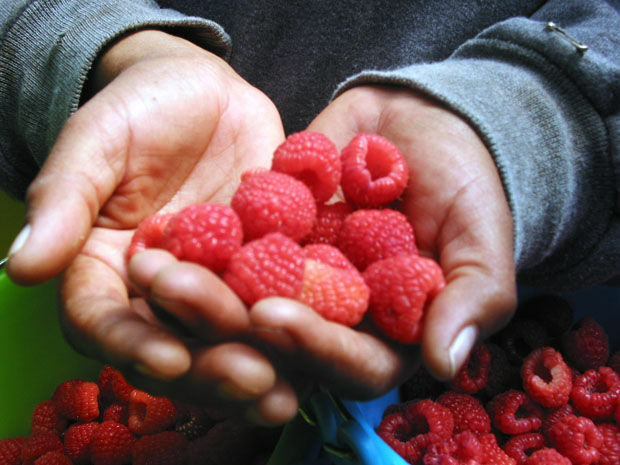 Washington produces 60 percent of the raspberries in the U.S. and 90 percent of those are frozen using a process called Individually Quick Frozen or IQF, according to the Washington Red Raspberry Commission. The current IQF process is to treat the fruit with a chlorine spray and then apply liquid nitrogen to quickly freeze the raspberries. This process leaves them susceptible to bacteria such as E. coli, Salmonella and listeria. Sablani’s plan is to expose the frozen berries to UV-C light for one to two minutes to kill any bacteria. UV-C light has a germicidal effect, and is already used to treat and kill bacteria in water. Sablani doesn’t expect a lot of challenges with the implementation of the UV-C technology. The UV-C lamps are inexpensive and cost anywhere from $100 to $300 each, making it affordable. “The food industry will really be able to embrace this technology,” Sablani said. One downside to this process is that the berries need to be rotated in order for the UV-C light to reach all sides of the fruit. This process requires the UV-C light to be applied to frozen fruit because it will be much easier to roll and less likely to bruise in the process. Sablani said they are working on a system to rotate the raspberries in order for the light to reach all sides of the fruit. Those processing the berries take great precaution to keep the berries safe, but as Sablani points out, sometimes that might not be enough. This UV-C light treatment can be used as an extra preventative step to keep frozen raspberries safe for consumption.